A fine day on the river was enjoyed by all. This was not supposed to be a clean sweep but Norm & Glenn could not help themselves. 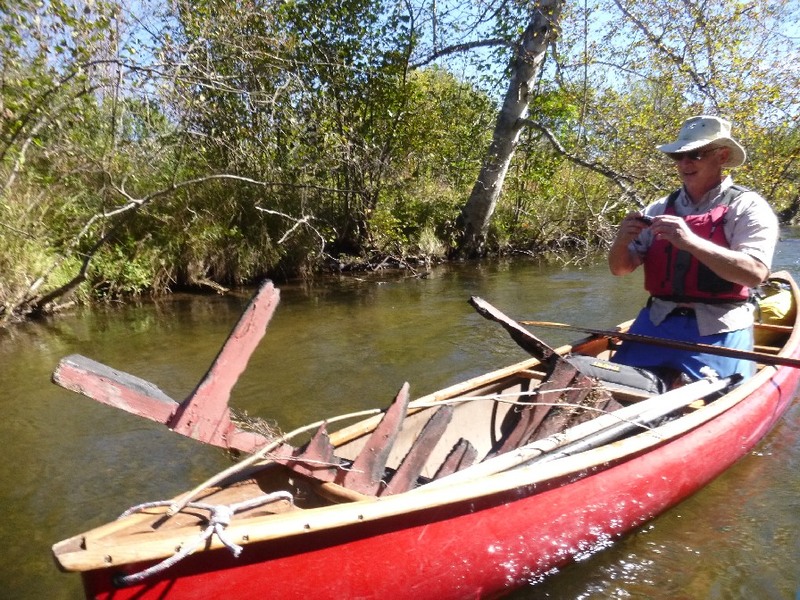 Thanks to Jocelyn and other paddlers for documenting the clean up with their photos. A burnt dock and plastic chair were removed from the river along with other debris. Kudos to all those who keep our rivers clean. It was a crisp sunny October morning to start the trip. The weather warmed as the day wore on. Trees have not started turning colors on this section of the river. The group lunched at Shumsky's Road while Max (Jocelyn's dog) explored the area and Winston (John Walton's dog) burned off energy chasing an old soccer ball removed from the river. After completing the trip some of the group retreated to Culver's for dessert. A few photos from the trip follow. Group photo before the start of the paddle. Glenn with what remains of a dock pulled from the Boardman. Norm and John enjoying the day's paddle. Jocelyn and Max on the water.